Bounce Up Pacts and Pore Putty: Chosungah22, Ver 88, Stila, Peter Thomas Roth: Do They Work? One of the trending things in the beauty scene now, particularly the Asian beauty scene, is Bounce Up Pacts, as they are called by Asian brands, or Pore Putty as they are called by Western brands. For those who may not have heard, this is basically a base makeup, akin to foundation, and functions quite similarly, in that it comes in a variety of skin-like shades, and is meant to provide coverage and a smooth finish to the skin. 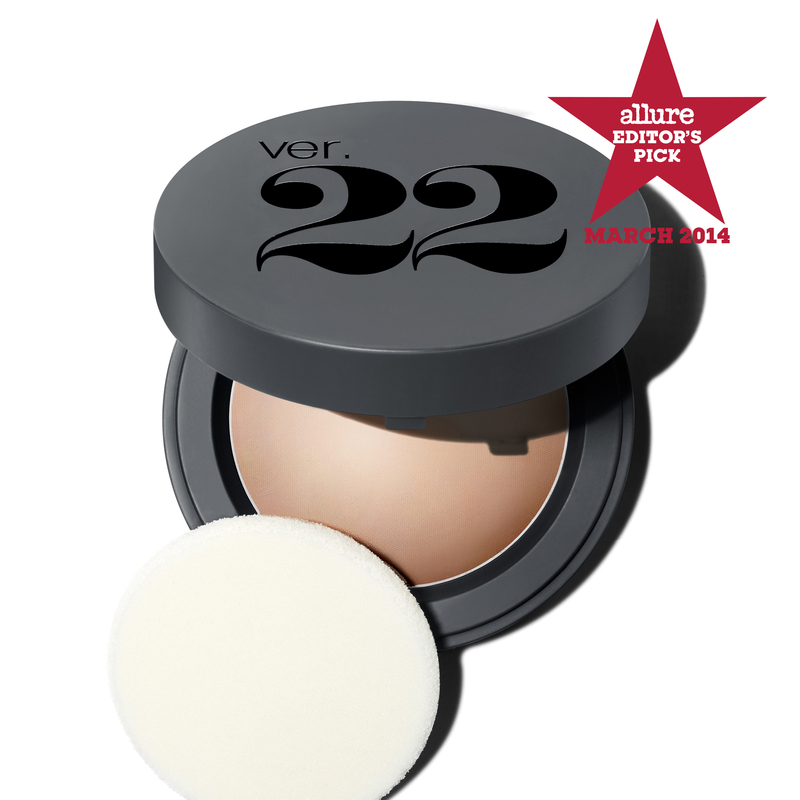 Bounce Up Pact, Pore Putty: New and trending here! What's different and new about these Bounce Up Pacts/Pore Putties, though, is the texture. These have a hybrid texture that's sort of similar to a dough, or Play-Doh, which you can roll up, ball around, squish, and so on. You can depress your finger into the pact, and like Play-Doh, your finger will leave a print on the surface, but you can smooth it out. So these are sort of like, not as liquid as traditional cream foundation, but not as dry as a powder, and the "Putty" or "Bounce Up" name is a reference to how malleable the products are. On Youtube, you can find all sorts of videos demonstrating the more interesting properties of this product, as you can see below. Interestingly though, this new generation of products aren't actually the first to use the phrase "pore putty". Back in the early-to-mid-2000s, Japanse brand Sana came out with a range of products called "Pore Putty", although none of them had a malleable, dough-like texture. Rather, the range's name was indicative of the supposed claims of the products - to hide your pores - and came in a range of liquids, powders, and creams, with BB creams, mineral powders, makeup bases, concealers and so on. I guess this Bounce Up Pact/Pore Putty thing must be pretty huge right now, because I received two real-life queries from friends about this class of product, as well as one online request via Twitter. So I figured, why not? Most of the questions I got were centred around 1) whether the Bounce Up Pacts/Pore Putties were really novel, new or groundbreaking, as well as 2) what are the ingredients that give the product its interesting texture? So we'll attempt to look at these two questions in this post! hello, @musicalhouses :) would you like to do ingredients analysis to Ver. 88 Bounce-Up Pact? It has been hot item these days. The best way to get blogpost ideas: Reader suggestions! Thank you for the idea! If you know my blog, you know what I'm going to say next - we're going to look at ingredients lists! It was quite hard to find the ingredients lists for some of the Asian brand Bounce Up Pacts, but after searching the internets and asking other bloggers, I managed to get the ingredients lists for 4 products: the Chosungah22 Bounce Up Pact Master, Ver 88 Bounce Up Pact SPF 50/PA+++, Stila Perfectly Poreless Putty Perfector, and the Peter Thomas Roth Pore Putty. With two "Western" Pore Putties, and two "Asian" Bounce Up Pacts, this should give us plenty of material to work with! So let's get started! One of the most prominent Bounce Up Pact products to come to the forefront is the Chosungah22 Bounce Up Pacts. Chosungah 22 (I have no idea if it's Chosungah22, as in one word, or Chosungah 22, as in two), is a Korean brand founded by a Korean lady named - you guessed it - Cho Sung Ah. They have a few versions of the Bounce Up Pacts, which are their most popular products. Basically, if you're familiar with BB or CC cushions, these look like the BB cushions, in that they come in round "pacts" and you apply with a puff applicator, but instead of having a liquid-soaked sponge inside the case, you have this Play-Doh-like product. Application is just like a BB cushion too - you dab it with your applicator puff, and then pat it on your face to blend, rather than swiping. Originally, I hoped to get the ingredients lists for all the different Bounce Up Pacts Chosungah 22 had, but I had lots of trouble getting a complete ingredients lists for them. Most online sources only had the "featured ingredients", which is useful for consumers, perhaps, but not so much for proper ingredients analysis. Fortunately, Kendra kindly took a photo of the ingredients list of her Bounce Up Pact for me and allowed me to use her photo on my blog, so here we are! From the ingredients list, we can see that the main ingredients are shimmer (Mica), film formers (Polymethyl Methacrylate), silicones and polymers (Dimethicone, Dimethicone/Vinyl Dimethicone Crosspolymer, Triethoxycaprylylsilane, Methicone), which have emollient and thickening functions, emollients (Caprylic/Capric Triglyceride), colour pigments (Iron Oxides), thickeners (Quaternium-18 Bentonite, Lauroyl Lysine), and oil absorbers (Silica). What can we make of this? Well, first we can see that none of the ingredients are particularly new - silicones, film formers, emollients and so on, these are all ingredients that have been used in cosmetics before. So although the texture certainly is new, there isn't a singular new ingredient that is behind this product. Rather, it is the combination of ingredients that give it this interesting texture. Quaternium-18 Bentonite is a clay, so that explains some of the texture, but the silicones, polymers and emollients help to give the product a creamy texture, while the oil absorbers keep it dry. The end result is a product that looks like a cream, but is much, much drier than an actual cream - there aren't any traditional oil-oils like there are in a cream, but there are silicones, which give an emollient feel but aren't as "oily"-feeling. This gives you a dry cream that can be moulded, just like putty, but looks "dry" enough to appear almost like a powder on the surface before you dig into it. So there you are - the individual ingredients may not be anything particularly new, but it's the combination of ingredients that gives rise to the very interesting texture. As a side note though, while researching this article, I came across this article (in Korean), noting that there has been an issue with the packaging of the Chosungah 22 Bounce Up Pact. 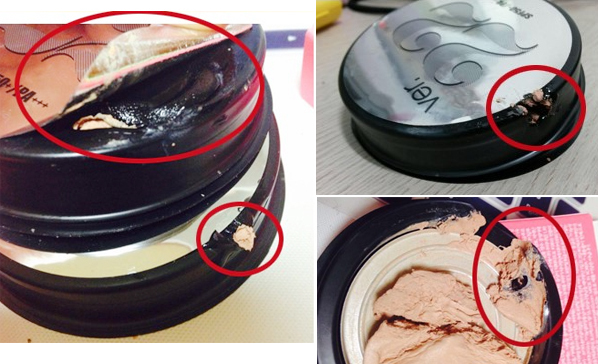 Apparently, according to the article (which I had to Google Translate because I don't know Korean), there have been some issue with the plastic casing on the Chosungah 22 Bounce Up Pacts melting, and apparently this is due to the chemicals in the sunscreen (which had recently been increased from SPF30 to SPF50) interacting with the plastic casing. I don't know if this is still an ongoing problem, as although the article was from March 2015, I haven't heard of any more recent cases, so hopefully the issue has been fixed! Let's try a Western brand now, and see if the Bounce Up Pact/Pore Putty remains the same. Stila's Perfectly Poreless Putty Perfector (gotta love all that adorable, amusing, alphabetically-acrobatic alliteration!) is perhaps one of the more famous Western-brand Bounce Up Pacts/Pore Putty products. Ingredients: Methyl Methacrylate Crosspolymer, Dimethicone, Hydrogenated Polyisobutene, Caprylic/Capric Triglyceride, Dimethicone/Vinyl Dimethicone Crosspolymer, Lauroyl Lysine, Pentylene Glycol, Aluminum Hydroxide, Silica, Hydroxyapatite, Mica (CI 77019). Again, we see the use of silicones and polymers (Methyl Methacrylate Crosspolymer, Dimethicone, Dimethicone/Vinyl Dimethicone Crosspolymer), emollients (Hydrogenated Polyisobutene, Caprylic/Capric Triglyceride), thickeners (Lauroyl Lysine, Hydroxylapatite), oil absorbers (Silica), shimmer (Mica), and so on. So, although the ingredients list doesn't look similar on first glance, we can see that there are some broad classes of ingredients that are used in both products. There are of course the silicones, as well as emollients, combined with a mix of oil absorbers. Here, the formula is different, but when the ingredients are combined, they yield the same "drier than a cream, wetter than a powder" kind of texture, which feels like putty or dough and is malleable. Again, it is the combination of ingredients, rather than any single groundbreaking or novel ingredient, that brings about the interesting texture. A last note of interest: while the Asian-brand Bounce Up Pacts seem to advocate using a puff or sponge applicator (or in some cases, fingers) to apply the Pacts, Stila actually advocates using a brush to apply their Poreless Putty Perfector. I have no issue with either application - I'd say that it's going to be a matter of personal preference and habit, and I'm not going to quibble over which one is the "correct" form of application. And we're back to another Asian brand Bounce Up Pact! Ver 88 (or Ver.88 - I guess sort of like "Version 88?") is, as far as I can tell, a Thai brand, although it claims that its Bounce Up Pact is made in Korea. 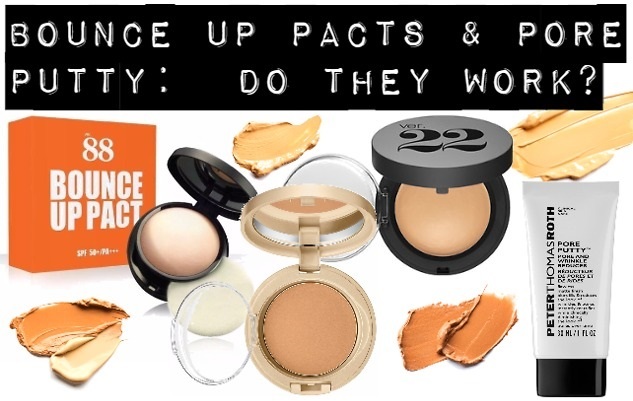 By far the most popular product is its Bounce Up Pact. Again, this is a product I had a lot of trouble finding the ingredients list for, but Our Beauty Story had the ingredients list on their blog, and allowed me to use it. So now I can also indulge in my ingredients analysis knowing I have the full ingredients list! Great, huh? The Ver88 Bounce Up Pact has, as its main ingredients, silicones (Dimethicone, Dimethicone/Vinyl Dimethicone Crosspolymer), sunscreen filters (Titanium Dioxide, Zinc Oxide, Octyl Methoxycinnamate), emollients (Triethylhexanoin), shimmer (Mica), thickeners (Lauroyl Lysine), absorbers (Talcum), and humectants (Butylene Glycol). After these, we hit Methylisothiazolinone, the preservative, so we know the ingredients below those are less essential to the product. Again, we can see the use of emollients, silicones, and absorbers to give just the right cream-but-not-quite-cream texture. And, as with the previous two products, obviously some tweaking must have gone into the product's formula to get that fun-to-play-with, putty-like texture, too. Our last one for the day! This is Peter Thomas Roth's Pore Putty. As far as I know, this is the only other Western brand other than Stila to jump on the Pore Putty/Bounce Up pact wagon. However, I don't really consider this a "true" Pore Putty or Bounce Up Pact product, despite the name, because it doesn't have that malleable texture that the other three products have. This is more like the Sana Pore Putty range, where the name "Pore Putty" is just that - a name that can be given to a variety of BB creams, powders, foundations, and so on, as long as it claims to help with your pores. It just so happens to come out at around the same time as the other products, so it managed to catch the hype. Indeed, the packaging of the PTR version also looks more like that of a typical BB cream or tinted moisturizer, with it being in a tube rather than a case. It claims to have skincare benefits in addition to cosmetic ones, too. Thanks to the Peter Thomas Roth website, I didn't have too much trouble tracking down the ingredients for the product. Ingredients: CYCLOPENTASILOXANE, ISODODECANE, DIMETHICONE, STEAROXYMETHICONE/ DIMETHICONE COPOLYMER, ISONONYL ISONONANOATE, SILICA, POLYSILICONE- 11, POLYMETHYL METHACRYLATE, POLYMETHYLSILSESQUIOXANE, DIAMOND POWDER, ENANTIA CHLORANTHA BARK EXTRACT, CASSIA ANGUSTIFOLIA SEED POLYSACCHARIDE, PLANKTON EXTRACT, LYSOPHOSPHATIDIC ACID, BHT, LECITHIN, OLEANOLIC ACID, MICA, BUTYLENE GLYCOL, CAPRYLYL GLYCOL, METHICONE, ETHYLHEXYLGLYCERIN, WATER/AQUA/EAU, AMODIMETHICONE, TITANIUM DIOXIDE, ALUMINA, ADIPIC ACID/NEOPENTYL GLYCOL CROSSPOLYMER, CALCIUM SILICATE, VP/VA COPOLYMER, DIMETHICONOL, HYDROXYETYLCELLULOSE, LAURETH-12, LYSOLECITHIN, HYDROXYPROPYL METHYLCELLULOSE, CHLORPHENESIN, POTASSIUM SORBATE, SODIUM BENZOATE, PHENOXYETHANOL, IRON OXIDES (CI 77499, CI 77492, CI 77491). We see here a bunch of silicones and polymers (CYCLOPENTASILOXANE, ISODODECANE, DIMETHICONE, STEAROXYMETHICONE/ DIMETHICONE COPOLYMER, POLYSILICONE- 11, POLYMETHYLSILSESQUIOXANE, METHICONE) with various functions, including film formers, emollients, and so on, emollients (ISONONYL ISONONANOATE), oil absorbers (SILICA), film formers (POLYMETHYL METHACRYLATE), humectants (BUTYLENE GLYCOL) and so on. We can see that functionally, the product has some similarities with the other three products, although it looks very different, with its liquid texture, rather than that of a "Bounce Up Pact". But, it will still form a nice film on the face, it will have some emollient effect on the skin, and it will also have a nice dewy finish on the skin. So, although it looks like a more traditional BB cream, it can still provide some of the benefit of a Bounce Up Pact. As a side note - I honestly have no idea what the diamond powder is doing in there, so I'm guessing that it's there as a shimmery ingredient. It certainly isn't going to help with your skin, other than make it look nice and sparkly. So, Are Bounce Up Pacts and Pore Putties Really All That? 1. Ingredients-wise, there isn't anything particularly novel. You get some emollient benefits, maybe humectant benefits, and a nice finish, but this isn't going to be super-groundbreaking in terms of formula. Sure, silicones, polymers, and emollients are pretty commonplace ingredients, and can be found in both creams, powders, makeup, skincare - almost every product you might put on your face. But if you like novelty, and if you like the idea of having a nice squishy Bounce Up Pact, there's certainly nothing stopping you from splurging on such a product. And for some people, maybe having your base makeup in the form of Play-Doh might actually work better with your application skills, so you might find you have a better finish with this product. Again, silicones, polymers, and emollients are pretty commonplace ingredients. But it's interesting to note that different brands use different polymers, silicones, and emollients. Polymethyl Methacrylate, Dimethicone, Dimethicone/Vinyl Dimethicone Crosspolymer and Lauroyl Lysine seem to be common across most brands, but there is some variation in other ingredients - for example, some brands use Caprylic/Capric Triglyceride as the main emollient, while others use Triethylhexanoin or Isododecane. This means that for some individuals, a particular brand's Bounce Up Pact might break you out, but another one might work for you (unless you happen to say, have a bad reaction to Dimethicone or Polymethyl Methacrylate - then that's just too bad). It might also translate into slightly different aesthetic feel and texture - for example, one Bounce Up Pact might be more dry than another, and so on. So although there are pretty large chunks of their main ingredients that are similar, I think the differences in formulation nuances might be picked up by some consumers. Also, some Pacts also advertise their plant extracts and other ingredients with skincare benefits, and the complexity of the formula also varies. The Stila Pore Putty is perhaps the most bare-bones formula, with the shortest ingredients list, while the Peter Thomas Roth and Ver88 Bounce Up Pacts/Pore Putties have much longer ingredients list, incorporating (probably really small) amounts of various plant extracts. So depending on your preferences, you might prefer one type of formula over the other. If you do, go ahead and buy one! I mean, I can totally understand the need for it! If you don't - relax, chances are you might already be able to acheive a similar effect with some of your existing products! i couldn't even get mousse products out of their containers to apply. This would be a disaster. No clue how to use it.